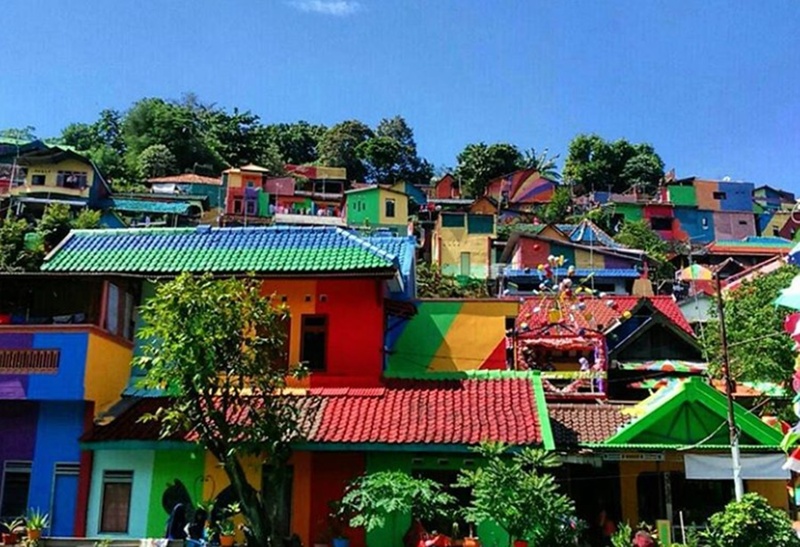 Kampung Pelangi, now known as ‘Rainbow Village’, is located in Semarang, in Central Java, Indonesia – 300 miles (480 km) east of the capital, Jakarta. It was an ordinary low-income village until April this year, when a high-school principal, Slamet Widodo, came up with the idea to paint its houses, benches and bridges in different bright colors in an effort to attract more tourists to the area and improve the economic situation in his community. This plan followed the example of other Indonesian villages that have undergone similar colorful changes, including Kampung Warna Warni and Kampung Tridi. The local council decided to give 300 million Indonesian rupiah (around $22,000) to turn Widodo’s idea into a reality. In a month the 223 houses in the suburb were each painted with at least three different, bright colors. The Indonesian Builders Association in Semarang provided paint and workers for the refurbishment, while the residents themselves took part in the painting process, as did the mayor of Semarang. After the news of the village’s colorful new appearance spread across the internet, it began to fill with tourists searching for some positive vibes in their day and that perfect Instagram shot. And since the makeover was made for that purpose, it is no surprise that Instagrammable murals can be found around every corner. About 7000 posts with the hashtag #kampungpelangi already exist and the number is growing every day. Among the most famous wall pieces are backdrops for people to pose with butterfly and angel wings, mystical creatures, balloons, umbrellas and even Kung Fu Panda himself. Residents are already feeling the positive economic effects that the new tourist attraction has had on their lives, increasing their income through markets for tours, souvenirs and street food. The village is now cleaner and more dynamic than ever – in fact, further plans for the project include removing waste from the local river.